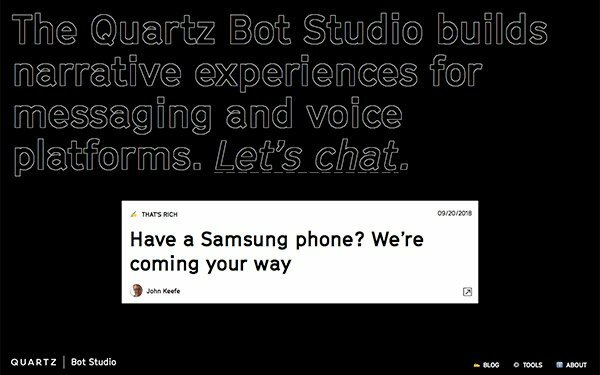 Quartz is expanding its work with bots and artificial intelligence with the launch of the Quartz AI Studio. The studio will work to help journalists at Quartzand other news outlets use machine learning to report their stories. John Keefe, initially hired to lead the Bot Studio, will now work with both studios under a new title: technical architect for bots and machine learning. Keefe said he wants the studio to help journalists "better understand when machine learning might help them, and then how they might use machine learning to help them,” Keefe said. That can range from document sorting to Quartz's custom code, he said. The AI Studio is part of the Knight Foundation’s efforts to support technology innovation in journalism to advance the field, especially in “small and mid-size news organizations,” stated Paul Cheung, Knight Foundation director for journalism and technology innovation. Stories reported using computer algorithms tend to come from large newsrooms with in-house programmers, according to a Quartz statement. The studio will help smaller newsrooms understand the technology by publishing how-to guides, best practices and open-source computer code with Quartz’s stories. Quartz wants to collaborate with other news organizations for at least half of its published stories from the AI Studio. Italso plans to add some artificial intelligence to Quackbot, its free Slack bot for journalists. Quartz, the business news outlet launched by The Atlantic back in 2012, was acquired by Japanese Company Uzabase this summer.